The head coach of Germany, Joachim Low has announced his 23-man squad for the 2018 World Cup in Russia but left out hot sensation Leroy Sane. The 22-year-old star who scored 14 goals and contributed 15 assists this season to help Manchester City win the Premiership title was deemed surplus to requirements by Joachim Low. Before the list was announced, Sane who also scooped Premier League young player of the year was pictured with fellow German stars Julian Brandt, Leon Goretzka, Jonas Hector, Joshua Kimmich and Marc-Andre ter Stegen during a chat with German Chancellor Angela Merkel on Monday, before he was brutally axed. 'That was a very close decision between him and Julian Brandt, which was made in favor of Brandt,' Low said in his press conference on Monday. 'Draxler, Reus and (Thomas) Muller are set. Leroy has a huge talent. He will be back again from September. He had not arrived in international matches yet. If it was a 100m race, it would have been a photo finish. He already has something extraordinary in the game and that speed that is needed internationally. Meanwhile, Sane's omission from the Germany squad for this year's World Cup is causing an outrage online. See Germany's squad for Russia 2018 below. 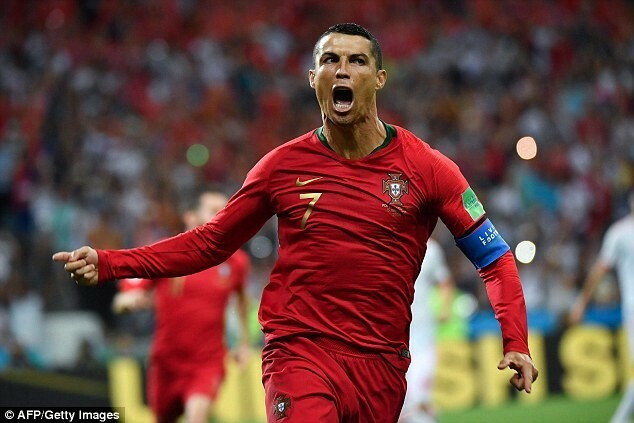 Superstar footballer, Cristiano Ronaldo showed he's one of the greatest of all time as he started the 2018 World Cup tournament by breaking records. The Portugal forward scored a brilliant hat-trick today in their opening game against Spain, which ended in a 3- 3 draw between the nations. The goals made him the first player ever to score in eight major international tournaments. Ronaldo has bagged at least one goal in every big event where he has featured, since after appearing for Portugal at a major tournament in Euro 2004. He's the oldest hat-trick scorer in World Cup history, aged 33 years and 130 days – the previous oldest was Rob Rensenbrink in June 1978 for the Netherlands against Iran (30y 335d). It's also on record that Ronaldo is the fourth player to score in four different World Cup tournaments - 2006, 2010, 2014 and 2018 - after Pele, Uwe Seeler and Miroslav Klose. Saudi Arabia football federation chief Adel Ezzat has named three players who will be punished when they return home from the World Cup after their disastrous opening-day defeat to the host nation, Russia. Many described their performance as one of the worst ever at the World Cup, after the Middle Eastern nation were defeated 5-0 by Russia in the opening game of the tournament in Moscow on Thursday. Reacting to the game, Adel was quoted as saying in the Al-Youm Assabaa newspaper, 'We are very disappointed by the defeat. This result is totally unsatisfactory, because it does not reflect the true level of our preparedness. Their punishment have not been revealed yet, but many are scared for the players who come from a country where they still live in fear of capital punishment. Not only do we have the finest jersey, at an average age of just 25 years and 337 days, Nigeria’s Super Eagles are the youngest squad in Russia and captain John Mikel Obi has urged the players to keep their nerves in check when they play Croatia later today. “It’s going to be very interesting because they like to keep the ball and so do we. We have a younger team so that might help us come the end of the game” Obi Mikel said on Friday. Mikel believes the exuberance of youth may be the Super Eagles’ secret weapon. “The players are full of energy and have a lot to prove because they’ve not played on this stage before. Not a lot of players were here for the last World Cup but I think that might be a good thing. It’s important for them to control their emotions so we have to keep that in check as well” he told reporters. International monthly men’s magazine based in New York City, GQ ranked all the kits of the national teams competing in the 2018 World Cup, worst to best. According to the magazine, Nigeria’s offering for the 2018 Cup is eccentric and off-the-wall in the best possible way. The heady mixture of cool green, white, and black evoke sensations of spearmint gum, while the blurred chevrons ooze cool. Croatia, Nigeria’s first opponent, has its checked red and white at second place. Argentina’s three stripes make number 3. At the far bottom is Senegal, followed by Panama and Spain. Frenchman, Arsene Wenger took charge of his final game ar Arsenal yesterday bowing out of the club after 22 years and and 1,235 games. He also expressed confidence that the new manager that will replace him will be inheriting a good side that can challenge for the league title next season. I see a bright future for my successor because the team has a good attitude and quality. The team needs some additions and if they get them I think they will compete for the Premier League title". 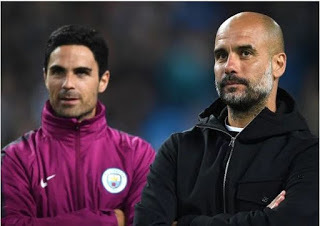 Former Everton footballer and Manchester City assistant manager, Mikel Arteta, has completed his interview process with Arsenal and has agreed verbally to become Arsene Wenger’s successor. According to the UK Independent, Arteta and his representatives have held advanced negotiations with the Gunners and are at a stage where backroom staff and financial packages are being discussed. The former Arsenal captain, would seek to bring in at least three of his own appointments. He will also offer Santi Cazorla a new player-coaching deal, with a role like Michael Carrick’s in his last playing season at Manchester United. Wenger took charge of his 1,235th and last game as Gunners boss last Sunday, a 1-0 win at Huddersfield. The 68-year-old is leaving after 22 years. © 2018 World Cup Updates. All Rights Reserved.